One of the offseason's most anticipated blockbusters came to pass Thursday with an All-Star catcher finally finding a new home and several young players moving the other direction. The Marlins have acquired No. 27 overall prospect Sixto Sanchez, Minor League pitcher Will Stewart, Major League catcher Jorge Alfaro and international bonus slot money from the Phillies in exchange for backstop J.T. Realmuto, the teams announced on Thursday. Sanchez instantly becomes Miami's top prospect and joins No. 99 Victor Victor Mesa as the organization's only representatives in MLB.com's Top-100 list. On stuff alone, the 20-year-old is considered one of the best right-handed pitching prospects in the game. His four-seam fastball routinely hits the upper-90s, and his two-seamer features plenty of movement to keep hitters off-balance. His curveball and changeup also have the chance to be above-average pitches. That arsenal plays up because of impressive control -- Sanchez has walked only 4.9 percent of the batters he's faced in four Minor League seasons. The 6-foot hurler did have injury issues during the 2018 season. 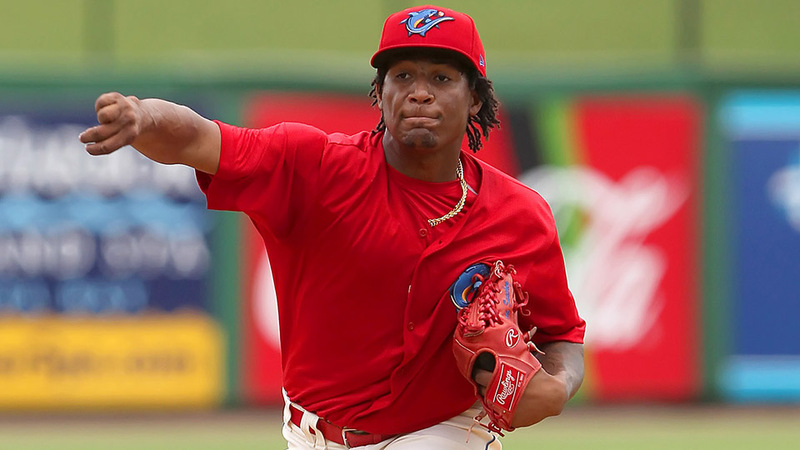 He made only eight starts for Class A Advanced Clearwater, posting a 2.51 ERA with 45 strikeouts and 11 walks in 46 2/3 innings, and didn't pitch for the Threshers after June 3 due to right elbow inflammation. He was scheduled to pitch in the Arizona Fall League to make up for lost time but missed out on that as well after experiencing collarbone soreness. Sanchez epitomizes a trend in the Marlins' recent prospect acquisitions, joining Sandy Alcantara and Jorge Guzman as hard-throwing righties who bring a ton of heat to the Miami system. Stewart is coming off a stellar full-season debut. The 21-year-old southpaw went 8-1 with a 2.06 ERA, 90 strikeouts and 21 walks in 113 2/3 innings over 20 starts for Class A Lakewood. Stewart twirled two shutouts, including a nine-inning three-hitter with 10 punchouts and zero free passes against Greensboro on May 30. The 2015 Draft pick cut his walks down considerably last season and ranked second in the South Atlantic League with an 0.98 WHIP. Alfaro also heads to South Beach one year after graduating as a prospect. The 25-year-old backstop hit .262/.324/.407 with 10 homers in 108 games with Philadelphia in 2018 and threw out 26.3 percent of attempted basestealers. He isn't scheduled to become a free agent until after the 2023 season, meaning the former Top-100 prospect could become Miami's catcher of the present and future. Realmuto finally leaves South Florida after an offseason full of speculation about where he'd be on Opening Day. The 27-year-old catcher was both a National League All-Star and Silver Slugger winner last season and finished with a .277/.340/.484 line, 21 homers and a 38.2 percent caught-stealing rate. His 4.8 WAR, according to FanGraphs, was the highest by any catcher last season, beating out Yasmani Grandal, who finished second at 3.6. Realmuto has two seasons remaining before he can hit free agency, and it's that level of team control, combined with him entering his prime playing years, that drove up the price on the trade market.